How do I personalise the banner on my bookerville site? I am trying to change the bookerville banner to my company. Notice the default is Bookerville's generic header. If you have a header banner already on the Internet somewhere (your own site, e.g.) you can simply copy & paste the URL to that image in the Custom Header URL box (green circle). Then tap the Save Header URL button. Alternatively, you can upload one by clicking the Browse button (yellow circle). Make sure the Calendar Header Image box is checked, and nothing else (unless you want to copy those settings, too). In the lower box, check all the properties you want to copy this header banner to. Then just click the Copy button. Notice the default is Bookerville's generic header. If you have a header banner already on the Internet somewhere (your own site, e.g.) you can simply copy & paste the URL to that image in the Custom Header URL box (green circle). Alternatively, you can upload one by clicking the Browse button (blue circle). 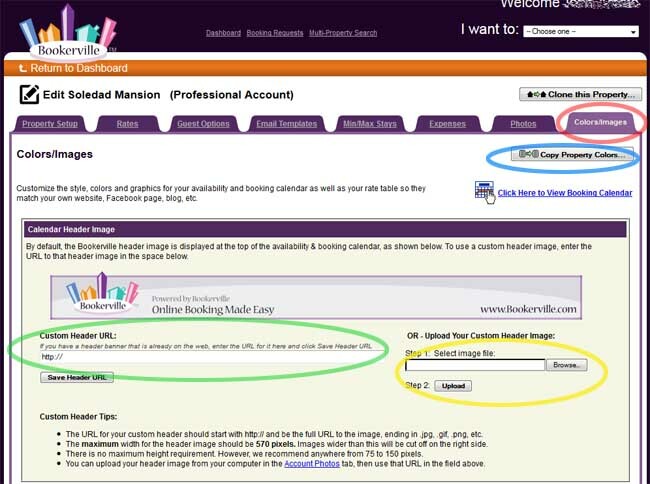 To replicate, or copy this header banner to all (or some) of your other properties' emails, click the Copy Email Settings button at the upper-right of this page (yellow circle). Click the Deselect All button in the upper box (unless you want to copy Email Templates...?) - (pink circle). 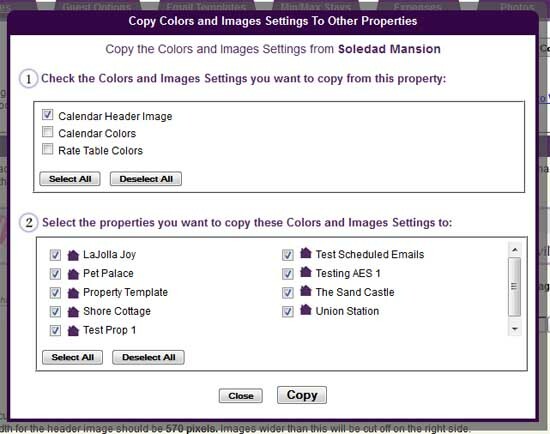 Make sure the Calendar Header Image box is checked (purple cirlce), and nothing else (unless you want to copy those, too). In the lower box, check all the properties you want to copy this header banner to. Then just click the Copy button. Thank you for asking this Deborah, as it gives us this opportunity to publish the answer as a Help Topic for all to see. 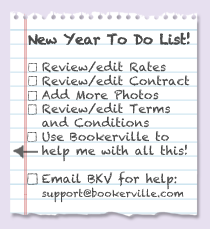 As always, if you need any help with any of this, simply contact us (support@bookerville.com). We are also willing to help you create header banners. How can I make it so there is NO header on certain e-mail templates? If not none, the another one besides the default one? What Do Your Emails Look Like on Your Guests' Mobile Devices? When Email Banners are Too Wide, It Makes the Text too Small to Read! 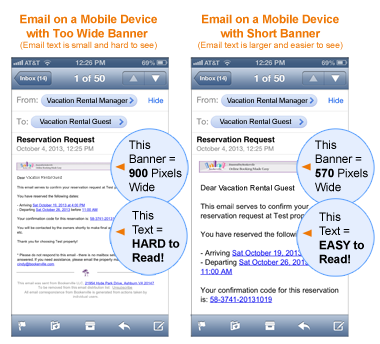 On a mobile device, the wider your email banner is, the smaller the email text will appear. In previous versions of Bookerville, we allowed email banners to be as wide as 900 pixels. However, times are a changing! In order to accommodate the increase in emails being viewed from mobile devices, we've changed our emails to display better on mobile devices. Your email banner should be no wider than 580 pixels wide. When email banners are longer than 580 pixels wide, they will be cut off on the right side. It’s simple: Reduce the width of your email banner to no wider than 580 pixels! 1) Look at your Bookerville emails. If your custom email banners look "cut off" on the right side, your email banner is too long. 2) To edit your banner, you can shrink the size of your email banner yourself using graphics editing software. Or, you can ask a graphics designer for help. Or, you can ask us for help. We'll shrink it for you at no charge. (No edits though) If you’d like a new, custom banner designed for your emails or you have edits to your existing banner, contact us to discuss pricing. 3) With your new, shorter banner in hand, go into Bookerville and pick any of your properties that will use this email header. 4) Click Edit on the property name. 5) Click the Email Templates tab. 6) Scroll down to find the Email Header section. 7) Upload your new email header graphic. 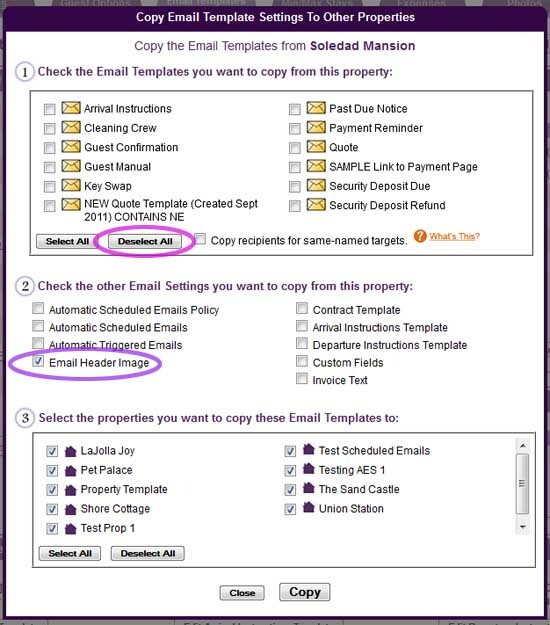 8) If you have more than one property that will use the same header image, use the Copy to Other Properties feature, located at the top right of the Email Templates page. 9) All done! Check out your new emails to verify that they are not getting cut-off. You and your guests can now enjoy easier-to-read Bookerville emails. Most vacation rental (VR) businesses require some kind of payment when a booking is made, and then the remainder is usually paid some time later - typically 14 to 60 days prior to the check-in date. Some VRs have multiple subsequent payments, often including a refundable security deposit along with the remaining balance due for the booking. There is a temptation for VR managers to record the credit/debit card number, expiration date, etc. of the card used to make the initial payment, and then use this to automatically charge the guest for the subsequent payment(s). But this is a bad idea. Here's why. 1) The card may be expired. Often the final balance (or other subsequent payments) are due months - perhaps even more than a year - after the initial payment has been made. If so, there's a pretty good chance the card is expired. 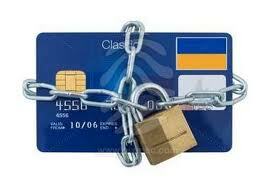 2) The card may be lost or reported stolen. Anything can happen, and the longer the time between the initial payment and any subsequent payments, the greater the odds are that the card may be out of commission. 3) The card may be maxed out at the moment. Or maybe it will be when you go to "cha-ching" it for the balance due, which for most VR's these days will typically be at least a few hundred dollars, and often exceeds a few thousand. If the guest was planning to use that card to pay other, routine bills, then your auto-charge could easily take the card near (or beyond) its maximum, rendering the customer unable to pay other bills. Worse, if it's a debit card, you're taking money directly out of a checking account, and then the poor customer might be bouncing checks or other scheduled payments, possibly even including their mortgage. Ouch! 4) Recording credit/debit card numbers, their expiration dates, or their "security codes" (CVV numbers) often found on the back, is considered taboo in the credit card and banking industry, and is probably a violation of the terms of your merchant account. Storing card data is only permitted for businesses that are PCI/DSS compliant - a stringent and not inexpensive certification process that must be performed annually. Getting caught recording this information while not in PCI/DSS compliance can get your account fined, suspended, or even permanently revoked. A far better approach is to bill your customer for any subsequent payments. This is best done with simple emails, which remind the guest what this is about, review any previous payments made, and clearly explain what is due next and when. The email should have an obvious link or button in it that they can click that will take them to a secure payment page to remit directly to your account. Bookerville provides Email Templates that can even be setup to be sent automatically based on your own custom payment schedule. You can also setup additional Past Due email reminders that will go out automatically if the guest has not paid after the due date. Invoicing the customer in advance of payments due not only avoids all of the above-mentioned troubles, it's also just plain courteous. It gives the guest a few days to get funds together, move money to a different account, etc. in order to pay you on-time and with their preferred card or method. Are your emails not getting delivered? Are some of your emails getting marked as spam, or not getting delivered? Read our new article on SPF records to address this growing issue. Everyone knows that email spam has proven to be a real problem. To address this, popular email systems like Gmail, Hotmail, Yahoo, AOL and others have really beefed up their spam filtering algorithms to prevent this unwanted junk mail from reaching their customers' in-boxes. Are you noticing a significant amount of your emails not getting delivered to your recipients, or winding up in their spam/junk folders? If so, read this article to learn about the top three things you can do to help alleviate the problem. We are happy to assist you in setting up your SPF records: just ask. Start the New Year off on the right foot! Copy last year's rates forward. Review and edit your contracts and email correspondence. Copy your new settings to other properties. Bookerville's powerful features makes it all easy! Superior online booking software, unbeatable pricing: Let Bookerville show you a better way!